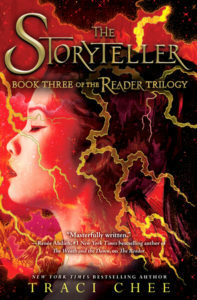 If you’ve been following me anywhere, you know I’m the ultimate fan of Traci Chee and The Reader Trilogy. I own them all in ARC and hardcover form. I have pre-ordered the last two. Heck, I even own two quote cards drawn by Traci Chee herself. You meet Me – the Mega Fan. The Reader series has meant so much to me. I read it early on and just adored it. Everything from the characters, to the story, to the themes. It truly illustrates the transformative power of reading, the magic of words and brave actions, and the characters I know and love. So I wasn’t ready for it to end. Heck, I’m done with the book and I’m still in denial it’s over. This book took a part of my heart, the same part of my heart the series has consumed. I can’t sing this trilogy, or Traci Chee’s praises high enough. Every life in Kelanna was a story-a tale to be lived and remembered and repeated. Some stories were modest in scale, existing in a single family or a small community of believers who whispered among themselves so their loved ones would not be forgotten. Others were so powerful they would transform the very fabric of the world. I had a choice. Control my future, or let my future control me. What was written always came to pass. Books are curious objects. They have the power to trap, transport, and even transform you if you are lucky. But in the end, books-even magic ones-are only objects pieced together from paper and glue and thread. That was the fundamental truth the readers forgot. How vulnerable the book really was. But not only to fire, or the damp, or the passage of time. To misinterpretation. Their love was the beginning of the end for us…What will you and Sefia destroy in your love for each other? I think that’s enough because the rest of the quotes I have are not spoilers, but I want you to read them for yourself. To feel the pain and tears when you read them. Because this book made me cry the whole day. And that’s an experience I won’t rob you of. Find The Storyteller on Goodreads, Amazon, Indiebound & The Book Depository. Also if you pre-order it you can get a gorgeous engraved gold bookmark. You want it. I am in love with the prize so much I am going to enter because, hellooo!! A signed hardcover?! Swag pack?! What book has made you cry the most in your life? Your enthusiasm for the series definitely speaks highly of it!